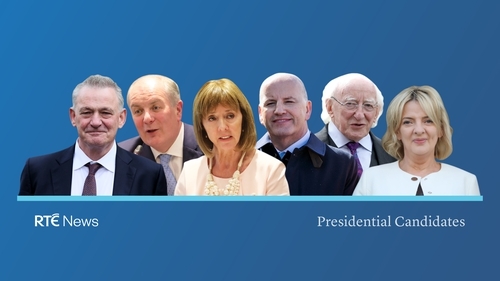 A new poll suggests that President Michael D Higgins has a significant lead over other candidates in the Presidential Election. The poll indicates he is on 70% support, a 56-point lead on his nearest rival. According to the latest Red C poll, announced on RTÉ's Today with Sean O'Rourke, the incumbent has a significant lead over his five rivals. Independent candidate Sean Gallagher is on 14%, followed by Independent Senator Joan Freeman, who is on 6%. Sinn Féin's Liadh Ní Riada is one point behind on 5%. Businessman Gavin Duffy stands at 4%, while fellow former Dragons' Den investor Peter Casey is on 1%. The poll was commissioned by bookmakers Paddy Power. RED C interviewed a random sample of 1,000 adults on the telephone. The margin of error is 3%. Separately, today's Red C opinion poll suggests that Fine Gael still commands the largest share of first preference votes on 32%, down one point from last month. However, Fianna Fáil has closed the gap on Fine Gael with a five point increase up to 27%. Fianna Fáil support has increased since last month at the expense of Fine Gael, Labour, Independents and Social Democrats. Sinn Féin is unchanged on 14%, while Labour dropped one point to 5%. Independents are down one to 12%, while the Independent Alliance are also down 1 to 3%. Solidarity/People Before Profit are on unchanged 2%. The Social Democrats are down a point to 1% and the Green Party is up one to 3%. Others are unchanged on 1%. The poll was commissioned by bookmakers Paddy Power and was carried out from 3-10 October.